Newbie - Can't get past the basics. I am completely new to Rc and RC equipment. In preparing to build my first model from the 'scratch-built' series I have been collecting and testing the RC components needed to control the model once built, but I have hit a problem and am at a loss to understand what is going on. 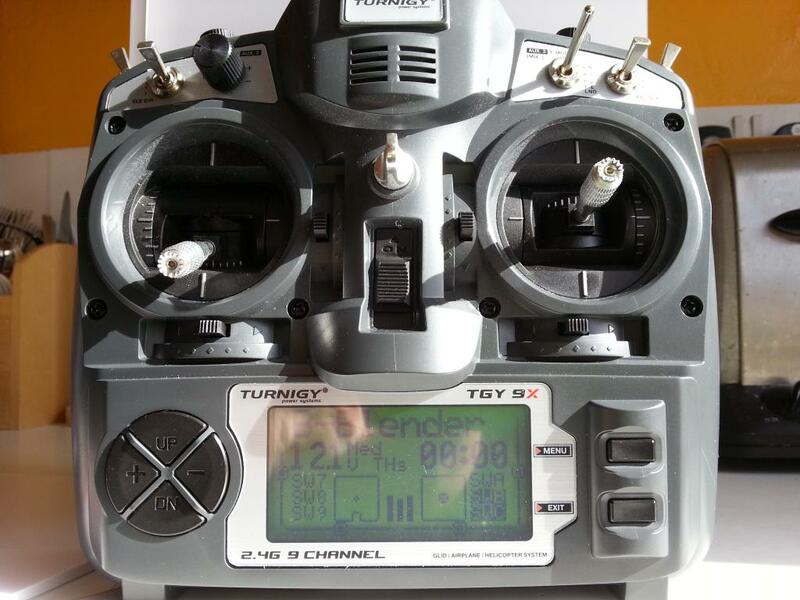 Transmitter: Turnigy 9x with FrSky MOD as detailed on RCModelReviews Channel. I am running through Josh's video on making and testing the connections along with calibrating the ESC for the first time. On the video Josh set's the throttle to max and then connects the battery to the ESC. The ESC gives the tone 123, beeps twice and then once again when Josh set's the throttle back to minimum. Here's where I run into trouble. When I copy this process my ESC gives the tone, 123, then beeps at regular 1 second intervals. It doesn't stop until I unplug the battery and all the while the motor is twitching on the bench like it's just been shot. 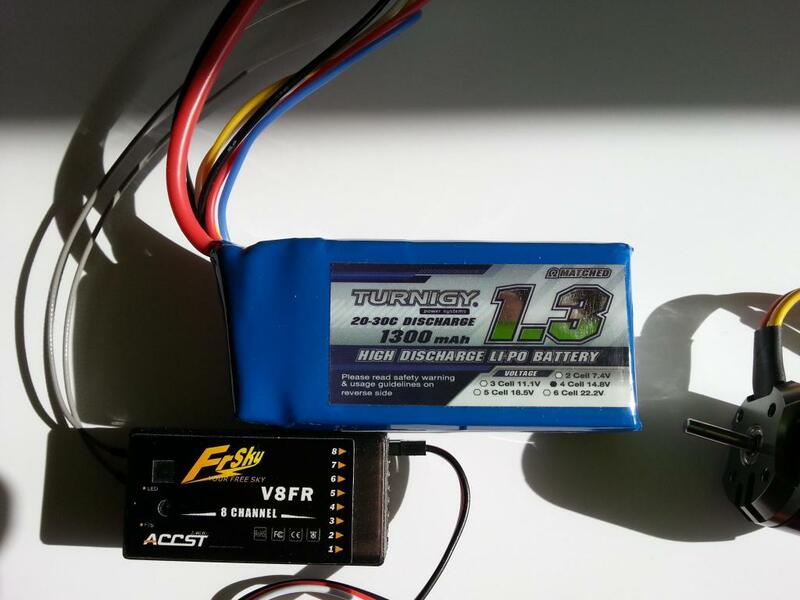 I have seen various suggestions for this ESC that suggest setting the transmitter to minimum before plugging in the ESC, but that makes no difference. Does anyone have any ideas about what I might be doing wrong please? Could you take a picture of your setup? After a closer thought, the problem might be the ESC not receiving a correct signal. 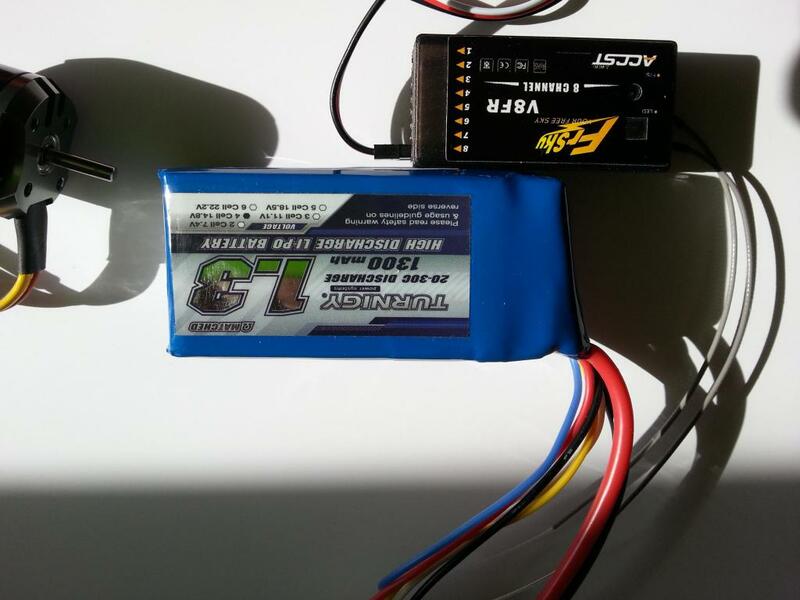 Have you tested any servos with the Rx? Put a servo in the throttle channel and see if it works normally. Remember that signal wire usually goes to the front/inwards and the black/brown negative wire goes outwards/down when plugging it into the Rx. I suspect the Tx-Rx connection might be the issue as you have modded it. Maybe you missed something. Did you bind the RX to the TX? Remove the prop so you don't get hurt!!! HI Everyone, thank you very much for your suggestions. I will answer them here where I can (sorry about this omission, it was late and I needed to walk away from this and get some sleep). THe first thing I should mention is that I forgot to include important information about the set-up. After MODing the Transmitter I upgraded the firmware to ER9x and used the Parkeflyer process as included here. I have then uploaded the "Sample Models" here. Yes, will try and do this later. Good point, I will put it on charge just to be sure. Now, you could be on to something here. I tried running through all the 'ports' on the FrSky receiver (to be honest I have struggled to find any information about what should go where on this receiver - It would have been so much easier if the sockets had been labelled rather than simply saying 1,2,3,4,5,6,7,8) and could not get any of them to operate a servo for the throttle channel. Tried swapping the plugs, tried reversing them ... all for nothing. I could not get any of them to work the throttle. Yes, this process was done successfully. I can connect servos to the receiver and operate the elevators and ailerons. A very important point, this one. I copied Josh and placed a bit of tape on the motor shaft rather than the prop. Thanks again for all your suggestions folks, they are very much appreciated. What about Throttle hold switches? I'd keep fiddling with the Rx. 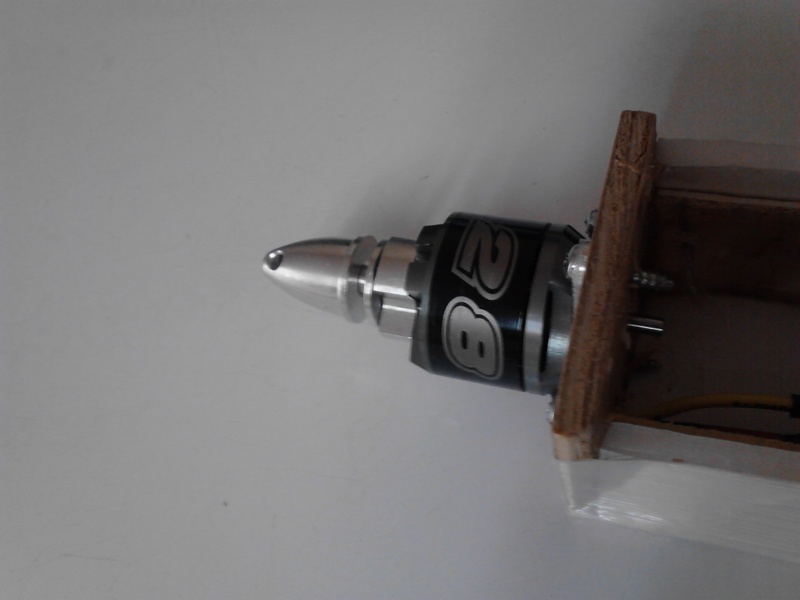 Plug a servo in any port and see what moves what. Do a list on what works and what doesn't. Actually that is extremely helpful. Thanks very much. The battery? 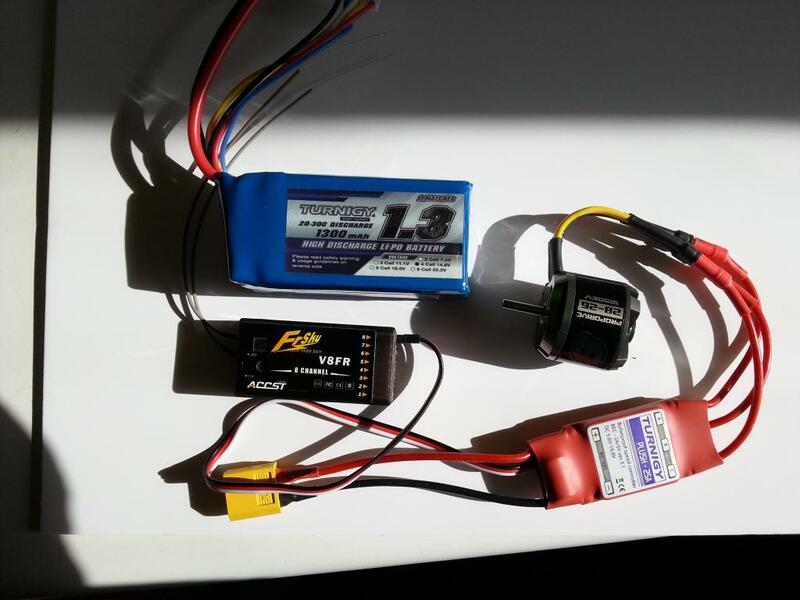 I am afraid I don't know enough about this yet to be in any way knowledgable about these things, the battery and the ESC (along with most of the other parts for the Baby Blender V2) were taken straight off Josh's list of parts for the build. I am simply trusting in his instructions until I get a little more experience in performance interaction between components. I think you are right about the Transmitter thought, am probably going to put it back to the basic ex9r firmware and test again. It may be something to do with the ParkeFlyer demo planes. Thank you again for your suggestions, they are much appeciated. I want to get up and flying with these scratch-built models and then gain in-flight experience. I removed the ParkeFlyer firmware and reverted back to the original Turnigy 9x V2 factory default. With this I could control a servo through channel 3. 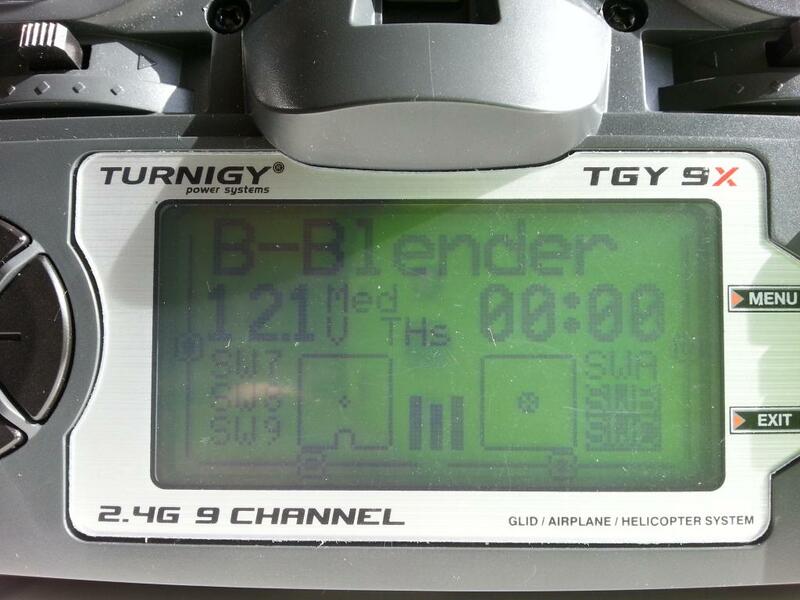 I then upgraded to the default ER9X firmware and confirmed that the transmitter/Receiver was functioning as desired. Once this was confirmed I upgraded to the ER9X FrSky firmware and re-tested. 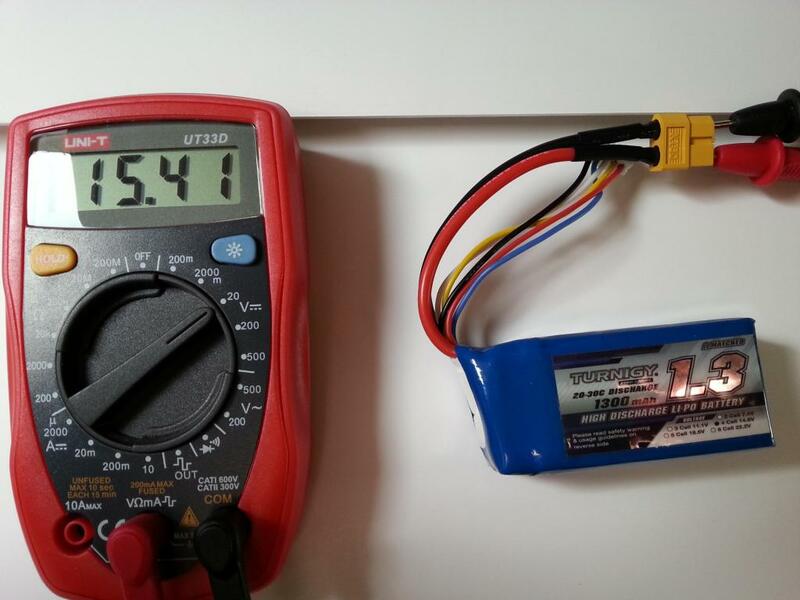 The ESC calibration was completed as expected and functioned according to the example in Josh's video. Thank you very much for all your suggestions as advice. Now I need to find out how to reverse the shaft on the NTM Prop Drive Series 28-26A. It seems to be pointing out the wrong end? Take away the locking spring at the end and separate the rotro from the stator. Unscrew the locking screws holding the axle. Press the axle in and tighen the screws. Assemble the rotor to the stator. 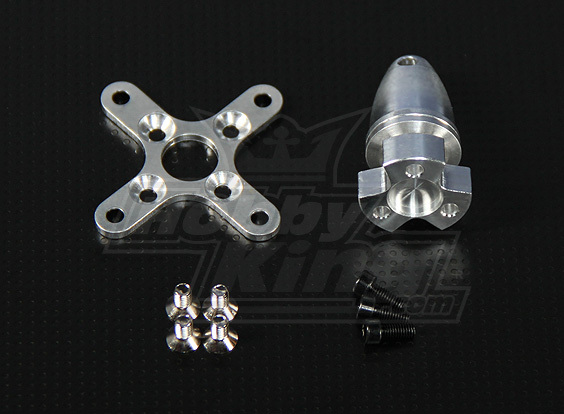 Or pick up the accessory kit they quietly mention on the site but many miss when ordering. Including me when I ordered my second one, I completely forgot to get the kit and had to make another order. It is not OR - it is AND if you want the propeller on the other side of the motor - plus you need another prop adapter. I have no idea why someone wants to mount the motor in front of or behind the firewall, or if the CoG makes someone need the extra space for something. I would wager for mounting it under the mount on a multicopter, like the new one the FT guys are developing.